The derivation of GPCR models from MSAs of the known sequences has a long tradition. A particularly comprehensive attempt,17 performed prior to the elucidation of the rhodopsin crystal structure, used distance geometry derived from the satisfaction of H-bond potentials and residue packing constraints from MSAs of 410 known sequences. An approximate model of the helix bundle was used to derive an average 7TMR structure that provided a template to derive specific models for 26 representative receptor structures and delineated a conserved core of 43 residues. Many of the predicted packing arrangements were confirmed in the crystal structure, including a salt-bridge between Glu122337 and His 211546. Whereas these models have been superseded by those derived from the rhodopsin crystal structure, many of the issues originally addressed were neglected by more recent analyses, especially contemplation of the physical interactions responsible for the structural stability of the transmembrane helical bundle. Apart from the obligatory network of interhelical H-bonds dictated by the modeling method, the involvement of sulfur-aromatic clusters organized as polarity gradients was highlighted, along with the colocalization of cysteine residues that may contribute to interhelical disulfide bonds. 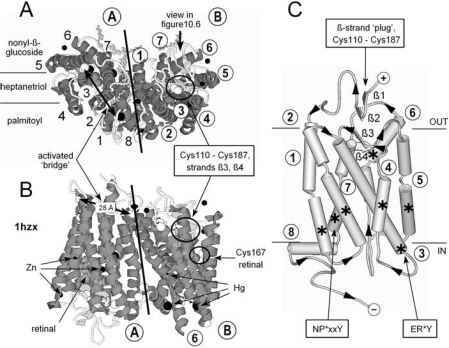 Subsequent resolution of the rhodopsin crystal structure revealed an extensive aromatic cage, supported by cysteine residues, that encloses the retinal chro-mophore (to be discussed in Section 10.6). Although no biochemical evidence demonstrates the formation of endogenous disulfide bridges in the TM helices, their artificial construction has proven to be a powerful mechanism for establishing interhelical interfaces, as well as the constraints on and extent of relative helix movement upon photoactivation. Distance constraints to aid model prediction of the activated states of both rhodopsin and many of the receptors have been provided by the introduction of individual cysteine residues into the TM helices with subsequent monitoring of their effects. Endogenous and introduced cysteines provide sites for spin labels, fluorescent resonance energy transfer (FRET) analyses, and SCAM, revealing helical orientations, movement, and altered accessibility upon photon or ligand activation.1618 Several paired substitutions can induce disulfide bridges that prevent light activation of rhodopsin, with other bridges being permissive, although none was capable of producing constitutive activity. FIGURE 10.4 Essential structural features of 7TMRs illustrated by rhodopsin. The antiparallel crystal dimer of rhodopsin (1hzx) viewed from the loops at the end of the helices, A, and from within the plane of the membrane, B, revealing the inhomogeneous distribution of participating lipophilic molecules (ball-and-stick) and metal ions (black Van der Waal's spheres). Retinal can be seen clearly from the cytoplasmic end in molecule @, although it is nearer to the intradiscal surface where it is masked by the b-strand 'plug' and conserved cystine bridge, Cys110-Cys187, in molecule @. The g-sulfur of cysteines is shown. C, the molecular topology of rhodopsin reveals the low contiguity of the 8 helices (only TM3) and the position of the most conserved residues in each helix (asterisk). The highly conserved ER*Y and NP*xxY motifs are at the cytoplasmic ends of TM3 and TM7, respectively. The Ca distances for disulfide bridges in high-resolution protein structures vary from 3.8 to 6.8 A19 — a wide range that reflects the flexibility of the five torsional angles and explains the low success rates for placement of engineered disulfide bonds.20 Only one novel disulfide is produced after photoactivation of rhodopsin, creating a bond that joins the endogenous cysteines Cys145355 and Cys316763 at the carboxyl ends of TM3 and TM7. Because these cysteines are 28 A apart in the dark-adapted structure (Figure 10.4A and B), rhodopsin must undergo a drastic topological rearrangement upon activation. reported structures contained mercury ions, soaked into the crystals for phase determination of the diffraction patterns. The breakthrough publication reporting the 3D structure of rhodopsin (1f88) was recalculated to correct for twinning (1hzx), allowing the placement of the palmitoyl, detergent, and heptanetriol molecules. These lipid and detergent molecules were regionally distributed, reflecting the discrete distributions of amphipathy across the dimeric helical bundle (Figure 10.4A). Because polyunsaturated lipids are required for rhodopsin activation,21 this emphasizes the different amphipathic demands of the structure. Similarly, the metal ions are not randomly distributed and, as usual, are mostly associated with cysteine residues (Figure 10.4B). The extent of infiltration by these stabilizing agents reveals the areas of accessible space within the protein, although it is not possible to distinguish between, say, the metal ions having gained access to the cysteines in the stably folded receptor structure or, by binding to the receptor, that they have contributed to stability and to the successful elucidation of the structure. The 2.8-A resolution rhodopsin structure has average temperature values around 50, although the intracellular loops have much higher values that are consistent with greater flexibility. 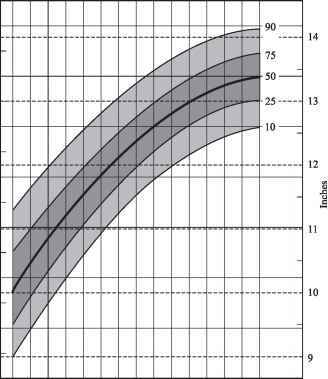 A temperature factor >60 is usually cause for concern in structural assignment and the values for the cytoplasmic loops of the rhodopsin structures range up to 120. This flexibility is particularly evident for receptor chain @, where the intracellular loops cannot be distinguished in the electron density (Figure 10.4B), which may be a reflection of the stabilizing influence of the missing interactive partner transducin. GDP-GTP exchange effects heterotrimeric G protein dissociation from the pAR, producing a receptor conformation with a reduced affinity for ligand, which throws off the ligand and is no longer stimulated. However, neither ligands nor G proteins have to dissociate for effective coupling to adenylate cyclase,22 and it is reasonable to assume that many receptors sample all of these affinity conformers even in the absence of ligand. The phenomenon of receptor "breathing" enables the entrapment of the agonist-induced conformer even in the absence of ligand, accommodating the concept of receptors with constitutively active mutations. As for allo-sterism in hemoglobin, the activated agonist-bound conformer may be the ligand-imposed "tense" form for some ligand-receptor combinations and the ligand-induced flexible or "relaxed" form for others. Evidence of receptor flexibility and conformational selection by ligands has been reported for AT1-R, using engineered mini-ligands of angiotensin.23 The adiponectin receptor appears happy even when standing on its head.15 Thus, some 7TMRs may be highly flexible; others may be relatively rigid; and yet others may require constant sampling of these states for signal transduction to be successful. Parsimoniously, most experimental and modeling analyses of ligand binding in drug discovery are interested in mini-molecules like Lipinski-esque classical drugs24 and assume ligand binding occurs in a rigid binding pocket within the helix bundle, like retinal in rhodopsin.